We’ve told you the story of this high-grade zinc player before, highlighting just how big Consolidated Zinc (ASX:CZL) could be. In fact since we first brought CZL to your attention back in October 2015, in the article Boutique ASX Zinc Explorer on Cusp of Production , the stock has been up as high as 86%. CZL has now sunk (at last count) 42 holes targeting two main zones at its flagship Plomosas project for a total of 4967m, meaning it’s starting to find the weight needed to put numbers around what it is sitting on. As the zinc price hit its highest level in several months , bolstered by optimism surrounding global growth, the macro outlook augers well for CZL as it continues to hit high grades. CZL is now coming to the stage where the drilling it has been doing will in the coming months be folded into a resource estimate. 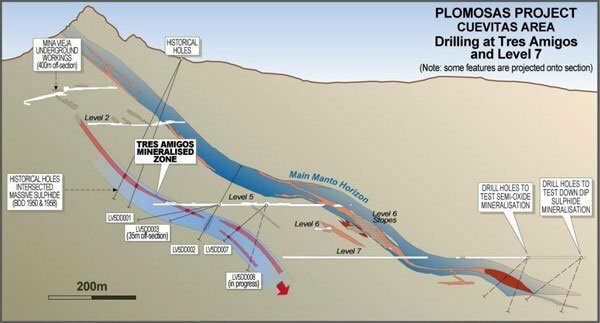 This company is starting out on the journey from explorer to producer, and the drilling done so far suggests that this could be one of the more unique zinc plays on the Australian market. Please be aware, however, that this is an early stage mineral play and success is not guaranteed. With CZL moving diligently towards its maiden JORC resource, we’ll keep you up to date on all the developments around this company, which is still capped at just under $11 million. For those who are new to the story, or even just want a re-fresher, we’ll go through the play and where CZL sits on the scale of world zinc producers-to-be. The key thing to note about CZL is that it is aiming to become a small-scale, but high-grade producer. To this end, the drilling completed to date has done nothing to harm the investment thesis. According to estimates prepared last year, CZL is sitting pretty in regards to grade. 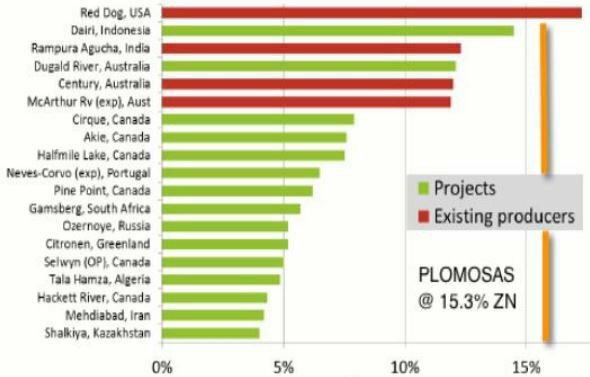 As you can see, CZL is aiming for a 15.3% grade at its flagship Plomosas project – putting it on par with the world’s highest grades. CZL’s project is in Chihuahua State, relatively close to the US/Mexico border. CZL has a 51% stake in the project, with an ambition to bump this up to 80 and possibly 100% as time goes on. The Plomosas project covers 11 exploration concessions over 3000 hectares, and has been mined down to several levels in the past. This mining, however, has really only focused on shallower deposits to date because of a combination of economics and technology. With newer drilling techniques, deeper horizons have essentially been opened up at a competitive for a player such as CZL – which as a small play isn’t necessarily looking for scale. When the big boys come knocking around a potential project, they need a certain amount of heft to the project to make it fly for investors. For a player such as CZL, however, Plomosas is just the right size. Above is a simplified geological model of what CZL is looking at with its Plomosas play – with the Tres Amigos zone only a relatively recent discovery by CZL. In the past, the Main Manto Horizon has been the main game for explorers at Plomosas, but what CZL has been able to do is continue drilling down past ‘Level 7’ – sort of where the economics of the play stopped for most explorers in the past. While Tres Amigos has been a treat for CZL thus far, at this stage the initial ore for its operation will come from Level 7 – so we’ll focus on that for the meantime. Initial drilling found a thick high grade zone . Just to give you an idea of some of the grades CZL is looking at from the Main Horizon, preliminary results for LV7DD002 were 6.75m at 27.2% Zn, 12.7%Pb, 60.4 g/t Ag. Keep in mind that this is a conservative zinc grade as 4.50m assayed >30%Zn and needed to be re-assayed. The grades are conservative estimates because five samples of the seven samples taken from the intercept returned assays over the maximum detectable limit of >30% Zn and need to be re-assayed using ore concentrate analysis techniques. The grades were simply too large to be measured using conventional techniques. Add to that the recently discovered Jacanda Manto above Level 7, and all in all you have three key plays:The Main Horizon extending below Level 7 , the Tres Amigos Zone , and the Jacanda Manto . It’s some impressive geology, but what’s the actual play? 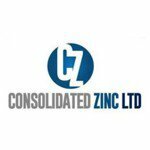 We alluded to it earlier, but what CZL is setting itself up to do is become a small-scale but high grade producer of zinc concentrate. It may be strategic, but to be frank, the reason CZL is going small-scale is because it doesn’t have a lot of cash – so it can’t necessarily afford to build a large scale processing plant and drill for big tonnage. Instead, it needs to keep things tight to avoid either diluting shareholders or leveraging its balance sheet irreparably. Instead, what CZL is hoping to do is take advantage of infrastructure which is already on site, but hasn’t been used since 2011. 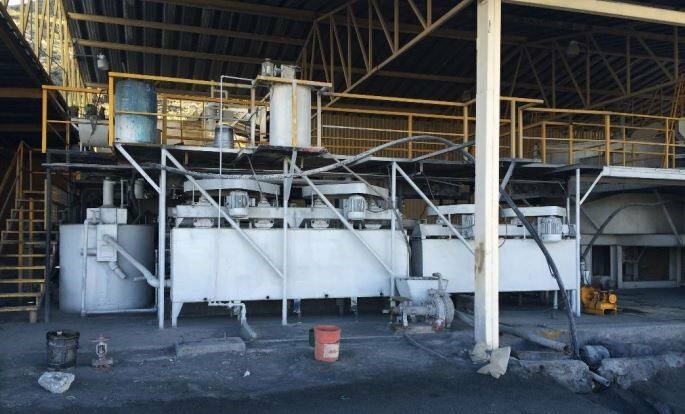 This is a shot of the processing plant on site, which needs a bit of TLC to get up to speed. For a minimal outlay though, what CZL will get is a processing centre with a nameplate production capability of 120 tonnes per day throughput, but could be upgraded to something near 200tpd. It’s thought that the majority of the initial throughput will come from the Level 7 Main Horizon, which is why we featured it pretty heavily in the previous section. The Main Horizon is the most proven system at play here, having been mined before, so it’s a perfect candidate for the bulk of the production – but at this stage the play is to feed the plant initially from the shallower Tres Amigos zone. The production in the initial stage isn’t likely to be huge, what it will do is get cashflow into the company and allow it fully drill out the Tres Amigos and Jacanda Horizon . As we’ll go into later, it’s drilling all the time and receiving the results of that drilling constantly, so knowing when to hit the stop button and submit the data to an assessor to come up with a maiden JORC resource can be difficult. Its latest thinking is the middle of the year, which is a slippage on previous estimates – but in return it will potentially be able to fold more results into the data, meaning a potentially larger JORC resource than would have been the case normally. As you can see, CZL has gone ahead and moved a Scoping Study up to coincide with the longer-tail JORC process – more than likely doing all the bits of the study which don’t require a JORC resource first and then adding that detail once it’s been received. Towards the back-end of March , CZL received assays back for holes drilled into the rock at Level 7 and into the Tres Amigos zone. Wide intercepts of up to 35% zinc were hit as part of the drilling, and at that point it had sunk a total of 27 holes targeting the Tres Amigos and Level 7 horizons. Interestingly, 90% of the holes it had drilled to that date had hit some kind of mineralisation – an extraordinary hit rate. As you can see, there are some truly big hits in that. We should warn that these are individual hits rather than representative of the overall resource CZL will put out in the middle of the year. Don’t base your investment decision on any individual results and seek professional advice when considering this stock for your portfolio. One of the more interesting things is one of the results it got back from a hole previously assayed from the Level 7 Main Manto horizon. A key feature of CZL’s exploration has been the number of times it’s had to go back and re-assay old holes because the grade was simply too high for conventional measurement. Normal measurement will only get you so far, but if the grade is above a certain limit than it needs to be tested using a method usually reserved for concentrates. Case in point: hole LV7DD002 . You may remember that we talked about this hole earlier in this piece, as part of the discussion on Level 7. Before the re-assaying, that particular hole had an initial hit of 6.75m at 27.2% Zn, 12.7%Pb, 60.4 g/t Ag. But, this was using a conventional method and simply didn’t capture just how high grade it actually was. 6.75m at 30.13% Zn, 12.67% Pb, 94.2g/t Ag. This is the sort of upgrade CZL is putting out on a fairly regular basis – demonstrating that Plomosas is somewhat of a high-grade beast. Meanwhile, at the start of April it began to tap the zone below Level 7, looking for a potential extension. Suffice to say, drilling from that horizon was promising as well . Again, massive grades in the offing here. The price of zinc went down in 2015, but so far in 2016 the price is showing the effect of a whole heap of supply starting to come off the market. Shutting down in 2015 were Vedanta Resources’ Lisheen mine in Ireland and MMG’s Century mine right here in Australia. With the latter at least, it shut down because the mine was simply tapped out rather than MMG making the decision to stop producing. Late last year, the world’s largest zinc producer in Nyrstar said it would suspend its operations in the US while Glencore took roughly 500,000 tonnes of zinc concentrate off the market as it underwent furious cost-cutting. 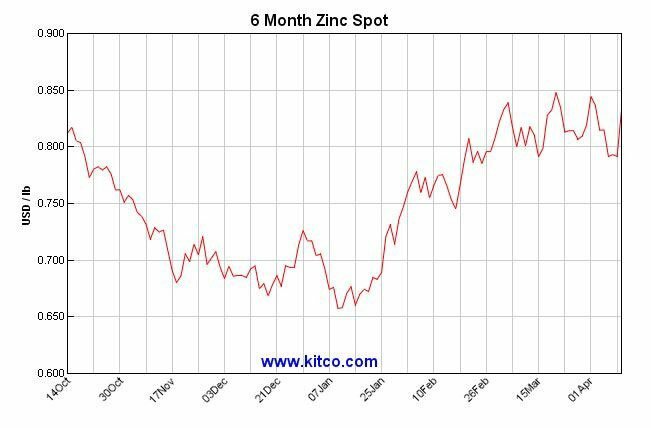 So while the price of zinc may have gone down by about 30% last year, the market has started to price in the effect of the lost production. According to Macquarie Research zinc mine output will fall by about 3.3% in 2016 , while JPM mine depletion and cost-related closures is to lessen output by as much as 4.5%. Global demand is expected to increase by 1%. Lack of supply, meet increased demand. As you can see, 2016 has thus far been a renaissance for zinc. At this point, we should reiterate that commodity prices are likely to change over time, and zinc is no different. Projecting a static or past price into the future is really bad statistics – and an investment decision on a speculative stock should not be made on commodity prices alone. CZL isn’t slated to produce this year, but rather in 2017 according to its internal timeline. As we said before, CZL has found itself in a pretty good spot. The market economics are shaping up nicely, just as CZL continues to demonstrate that it’s sitting on a truly unique high-grade opportunity. With every drilling update, it seems that invariably CZL needs to re-assay cores because the grade on them is simply too high for conventional measurement . That’s generally a sign you’re onto something pretty good. 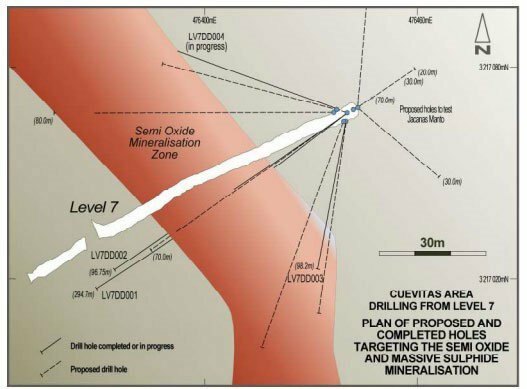 CZL is getting to that stage, where as an early stage play, it is starting to roll its drilling results into a JORC resource, giving the market the first clear indication of initial resource size at the project. One thing’s for sure though – if the drilling is any indication, it’s going to be a pretty high-grade resource. We’ll just have to wait to find out – but we should know within the next couple of months.